microchipped and vaccinated by Cats Protection and then waited for a home. Having decided to take two of our trio, the new owners just couldn’t leave Riva and have adopted all three brothers. We hear all the boys are settling well and didn't take long to find a comfy chair each. On 30/06/12 Kim and Mal said about the brothers, "The boys are happy. Rome is lazy and a mummys boy. The hunters are Riva and Amalfi. Amalfi prefers men, Riva is happy with either. All will take a bribe". The boys are enjoying their new home very much and having settled indoors they couldn't wait to explore the great outdoors. 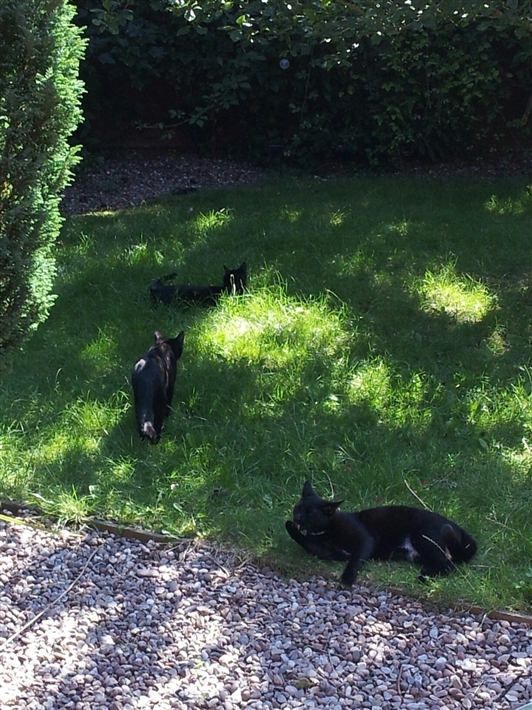 The garden seems a hit, though they all stuck together trying to find the best shady spot each. Malcolm & Kim updated us at the end of September 2012 and how the boys personalities were showing: They are all friendly with us and greet us when we come home. Rome: Is a lazy cat, he is still the biggest and noticeably bigger than Riva, but he is never first to dinner but I think he sneaks back and finishes everything up, he asks to come up on Kim's lap, but never sits on mine. However he can move when he wants to and is the one that catches the odd bird...or frog. Riva: Is still more of a kitten and likes to play, but does not come up on your lap, even if you put him there he stays only a few seconds, he's not in a panic to go, we just don't think he likes it much, when visitors arrive Riva disappears even if its raining, so does not like strangers. However its Riva who defends their territory taking on much bigger cats and seeing them off (Amalfi just runs away, Rome can't be bothered!!). Riva is very interested in what we are eating and drinking and you have to watch your cup of tea (decaff), in fact he will appear from nowhere if he hears a spoon in a cup, he does not get lucky often!! !, he can be a pain at the breakfast, I have to keep my arm around my bowl. We suspect as a kitten his mum did not give him as much attention as Rome and Amalfi, so we are trying make up for it. We are very happy with them and I think they like us. The boys are 2 today - Sunday 4th August 2013, and don't they look content. We suspect Rome, Amalfi & Riva have had some birthday treats. Christmas 2013, the boys are waiting for Father Christmas! May 2014 and the boys still sticking together, just lovely.